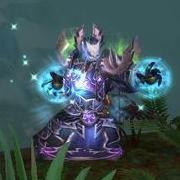 This thread is for comments about our Affliction Warlock guide. Right, so basically, If haunt is not up, and you have trinket, darksoul, low boss or many shards, throw haunt. But logically also, as long as you have 4 or more sharrds, spam haunt regardless. I guess the real question is, Should haunt ever be refreshed while it is still up? How many shards should i keep for a rainy day with which procs and conditions? If you have 4 Soul Shards and you go through the list of things to check, the only possible answer is to refresh Haunt. So, if you have 4 Soul Shards, cast Haunt, regardless of anything else, even if it means refreshing Haunt very early. Just noticed a spelling error under the 'Demon' subtopic. The Felhunter is spelled Felunter. there is a new glyph in the current game for soulswap which increases the duration of the time you can safe a dotline as a buff for 27 Sec.. That means you might be able to safe a fresh dotline for about 30 Sec. Do you see any value there for the shard management, e.g. saving freshdots with agony on 10 stacks, about 15-20 Sec before an add is spawning. The time could be used to generate new shards and it could be a possibility to plan swaps. There is merit to using this glyph for what you suggest. The reason why we don't mention it in the guide is that it is a very niche use. Also, the main purpose of what you are suggesting is to add burst damage to your Affliction rotation, but for burst damage, you are usually better off going for Demonology or Destruction. I will discuss it with Gahddo and see if there is any need for Soul Swap explanations in the guide. Glyph of Siphon Life causes each tick of your Corruption to heal you for 0.5% of your maximum health. My in-game tooltip says 0.35%. Hi! Question: If you have the Tier 5 talent Grimoire of Surpremacy, which upgrades your Doomguard into a Terrorguard, does the Tier 7 talent Demonic Servitude, which states you can summon Doomguards and Infernals as permanent pets, make the tier 5 talent obsolete? What I mean is, will it turn your Terrorguard back into a Doomguard, and same for Abyssals? I haven't played WoD yet, so I have yet to see the changes. If my Seed of Corruption explodes before I could cast another Seed of Corruption, should I prioritise SoC or putting dots on other mobs? You prioritise casting Seed of Corruption, if you have a Soul Shard for Soulburn. OK so after I've got Corruption ticking on everything I should just DoT everything up with the other DoTs? Why should you only cast Haunt when you have atleast 3 shards? And how did you calculate the stat priorities? Because when you use the Terrorguard, he doesn't benefit from mastery, but he will benefit from haste. Isn't haste better than? I don't think it says anywhere to only cast Haunt if you have at least 3 shards available. For the stat priorities, Terrorguard is accounted for, but is not enough to make Haste better than Mastery, especially with more than 1 target. We get stat weights with SimC. Hello! Its written that "Soulburn: Haunt is strong for sustained cleave damage and single-target burst damage. It gets stronger, compared to the other talents, as your item level increases." Should we at some point change to soulburn instead of demonic servitide(at single target)? and if so, when? There is a point at which all 3 talents are relatively equal single target. The tier 17 set bonuses play a major roll in that. Once you get the 2pc/4pc from blackrock foundry, soulburn haunt becomes much stronger. It also has slightly better scaling in general than the other talents. Basically, you don't have to worry about it until BRF is released. You say in your update from January that haste is slightly ahead of mastery. I think you should therefore adapt the recommendations for the enchantments. In the current version you still recommend mastery. Why would you not want to also keep the unstable affliction DOT up on a single target fight? Is it not worth the mana or something? Glyph of Unstable Affliction Icon Glyph of Unstable Affliction reduces the cast time of Unstable Affliction Icon Unstable Affliction by 25%. This is not a DPS gain. The base cast-time of Unstable Affliction is already 1.5 second, which is the value of the global cooldown, so what this glyph does is allow you to finish your cast of Unstable Affliction faster, but once Unstable Affliction is applied on your target, you still need to wait for the global cooldown to finish, before you can cast something else. On the Rotation page you mention in the Soulburn paragraph that you'll never use Soulburn on Soul Swap while raiding, but then you recommend doing just that for both opening rotations. Just a bit confusing. Probably just forgot to edit that out for 6.2, as there was really no reason to use Soulburn-Soul Swap until now. Its funny how the guide is "approved" by "noname" warlock that not only hard, if not impossible" to find on any top logs, but also does not even have all mythic kills. Thank you for that! That was a general comment and I've amended it to say that you won't use Soul Swap, except during the pull, the idea being that at the pull, it is important to enter Dark Soul as soon as possible, to have it up with trinket procs for as long as possible. He's the main theorycrafter of the spec and everyone follows his advice. What more do you want?